Montana Test.com - Results for: Savage Arms Predator Model 10 Predator Hunter Hunter Screened Mossy Oak Brush Synthetic Stock! Reviewed! Savage Predator Hunter Caliber 204! 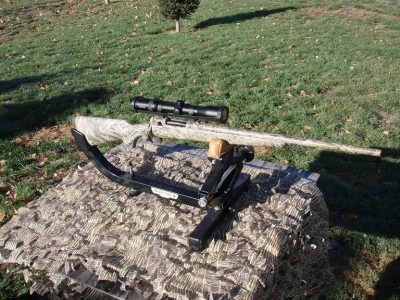 The Savage Arms Predator Hunter new for 2007 might just be the rifle you want to take care of those annoying gophers and prairie dogs. The Predator is a nasty looking bolt-action rifle dressed out in perfectly screened Mossy Oak Brush synthetic stock. The Predator chambered in .204, 223, 22-250, we are testing the .204. My son Chris has shot hundreds of rounds and takes it everywhere with him and has dispatched mutiple prairie rats and coyotes. Chris reports it is scary accurate, but with a 32 grain bullet wind does play a factor. The Predator includes Savage Arms exclusive AccuTrigger™ adjusts from 1.5 to 6 lbs and you can adjust yourself and an internal box magazine holding five rounds. A 22-inch medium contour barrel, oversized bolt handle, and rounded forend make the Predator a fun gun to shoot. Manufacturer Suggested Retail Price (U.S.), actual price may vary. NOTE: Appearance and specifications subject to change without notice. NOTE: Savage has some customers that order non-catalog items to their own specifications. In certain cases, those specifications may exclude the AccuTrigger. This item must be shipped to a licensed FFL holder.